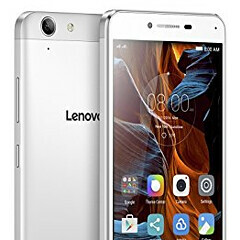 Back in February, during MWC 2016, Lenovo announced two new affordable smartphones, the Vibe K5 and Vibe K5 Plus, saying that they would not be released in the US. However, the Vibe K5 Plus - which is the better handset among the two - can now be bought via Amazon, thanks to a third party seller (which has 98% positive feedback from customers). Similar in size and design to the Vibe K5, the Vibe K5 Plus is made out of metal, offering dual SIM support, 16 GB of expandable storage space, 2 GB of RAM, and a 2750 mAh battery. A 13 MP camera can be found on the back, while the front houses a 5 MP camera. The K5 Plus is superior to the regular K5 thanks to its 5-inch 1080p (Full HD) display and its octa-core Snapdragon 616 processor (while the K5 features a 5-inch 720p screen and a Snapdragon 415 CPU). For a closer look at the new phone, check out our Lenovo Vibe K5 Plus hands-on. Unfortunately, the Vibe K5 Plus currently runs Android Lollipop, and doesn't support US LTE bands (but you can use it on the 3G networks of AT&T and T-Mobile). There's no info on what kind of warranty you're getting if you're buying the device via Amazon. However, since the phone is not officially sold by Lenovo, we don't think it comes with US warranty. Despite all this, if you still want to get the Vibe K5 Plus, it'll cost you $209 unlocked - see the source link at the end of this article. Anyone interested? If you like 5 inch phones the Xiaomi Redmi 3 or 3 Pro are better buys. They weigh about the same as the Vibe K5 Plus but the Redmi is less expensive and, best of all, it has a 4100 mAh battery. Check out GSM Arena's battery life list, it is near the top. Like most Chinese phones, they don't work on US LTE bands but they have band 7 which works in Canada on Bell, Rogers and Fido.